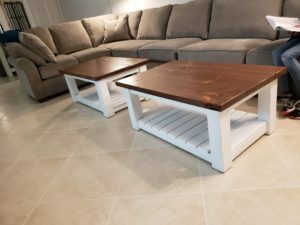 This set consists of custom made coffee tables, a sofa table, a high top shelf table, a farm table with bottom shelf and 8 chairs. The whole set is stained and painted to match. The table aprons have a design added to them on all 4 sides of the dining table and the fronts of the wall table and sofa table. The video pretty much sums it up. The farm table w/ shelf in the dining area is unique having a storage area for whatever just above foot level. It can be used also to rest feet on while sitting. 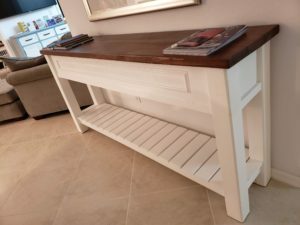 The other pieces were built exactly to size needed for this condo layout. All the tables were built by hand by Jesus Tables made of 100% solid wood. 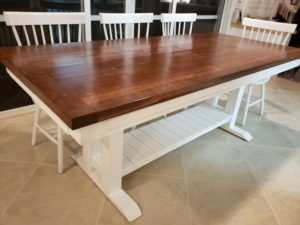 This Naples Farmhouse Table Set turned out perfect. Big thank you for Mr Daniels for letting us build these very cool unique pieces.